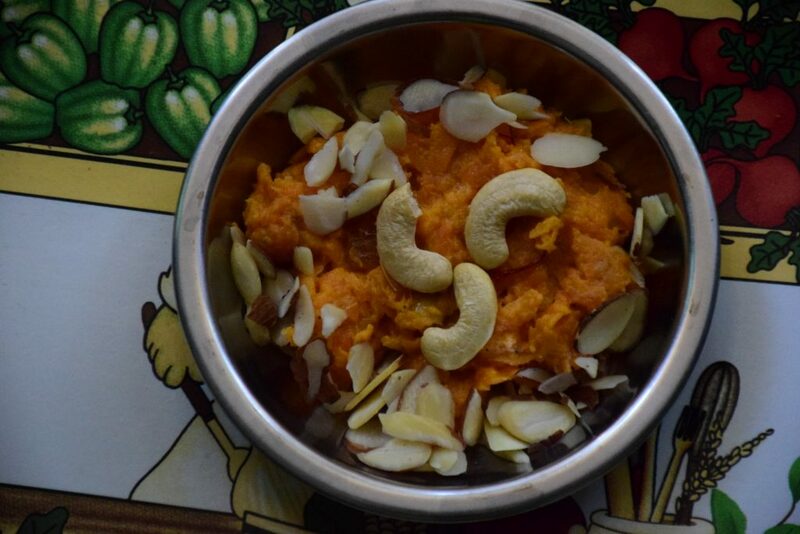 Shakarkandi or sweet potato is mostly consumed in all fasts and festivities in Indian homes. Its sugar is not only good for health, but this dessert also tastes heavenly during fasts. 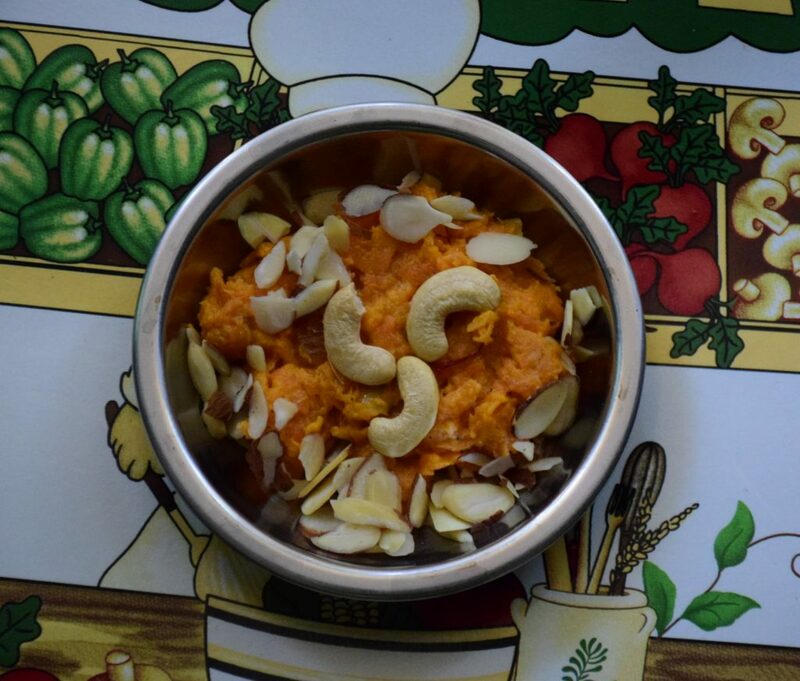 I first came to know about this halwa (Indian sweet pudding) from my mom, who has been my first mentor of life. This dessert is not so sweet since it uses very less sugar than any other pudding (halwa) would need. Its natural sugar and fiber content also makes it the right choice during fasts . 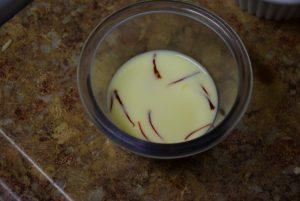 I am reliving my “mayeka days”(when a girl visits her parents home after marriage) through this recipe. Hope it takes you on some journey too. If you have any such experience or memory, please don’t hesitate to share that with me in the comments below. Let’s check this recipe now. 2. Heat some ghee in a wok(kadhai). 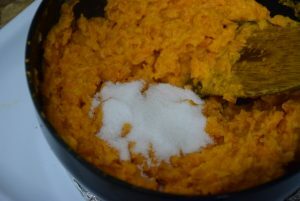 Add the boiled sweet potato to it and keep the heat on lower than medium. Turn it with spatula for even roasting. Roast on low heat for at least 5 mins or till you smell the aroma of roasted potato. 3. Prepare the nuts according to your preference. I chopped cashews ,silvered almonds and crushed cardamom. You may fry them in ghee for added taste. 4. In the wok (kadhai) , now add the milk with saffron strands and evaporate it till it gets absorbed in the halwa and the sweet potato leaves out sides with ghee. This will take 5 to 7 minutes. 5. When the shakarkandi has left sides of the wok (kadhai), add sugar (to taste), cardamom and nuts. Save some nuts for garnishing in the end. 6. 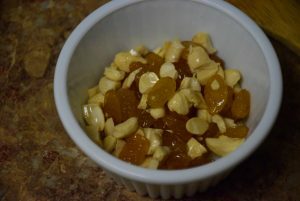 Garnish with nuts and serve hot. This sweet dish is good for those who prefer low or no sugar. It can be prepared without adding any artificial sugar. This Halwa is sweet in itself. It is often offered as prasad during Navratri fasts. This is my 2nd post for BM#90 for the 4th week of July under the “Single-serve Sweets” theme. If you want to know more about it , please check Blogging Marathon. 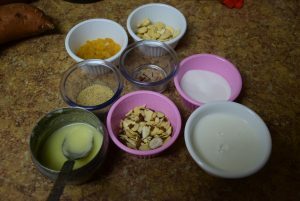 You may check my other single-serve recipes like No Bake Cheesecake, Shrikhand, Badam ka Halwa etc . If you wish ,you may check Sooji ka Halwa, Aate ka sheera, Gajar ka Halwa, Mango Halwa and other Desserts too. 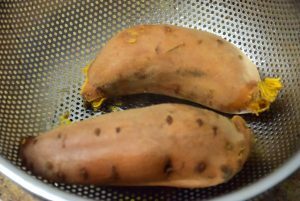 Boil the sweet potato well in a pressure cooker or microwave after washing in cold water. You may fork it through or make cuts with a knife before microwaving for 2 mins. 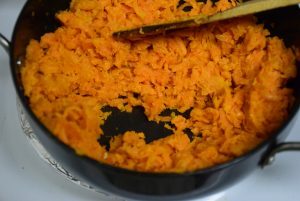 Once it is cooled, peel off the skin and grate it in a bowl. 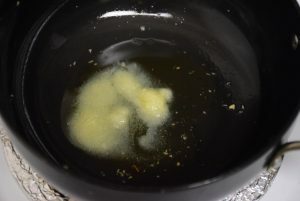 Heat some ghee in a wok(kadhai). 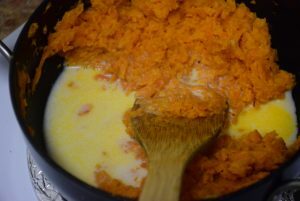 Add the boiled sweet potato to it and keep the heat on lower than medium. Turn it with spatula for even roasting. Roast on low heat for at least 5 mins or till you smell the aroma of roasted potato. Prepare the nuts according to your preference. I chopped cashews ,silvered almonds and crushed cardamom. You may fry them in ghee for added taste. In the wok (kadhai) , now add milk and evaporate it till it gets absorbed in the halwa and the sweet potato leaves out sides with ghee. This will take 5 to 7 minutes. 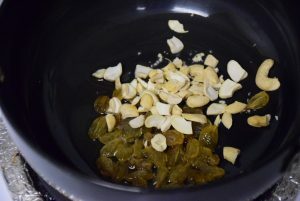 When the shakarkandi has left sides of the wok (kadhai), add sugar (to taste), cardamom and nuts. Save some nuts for garnishing in the end. 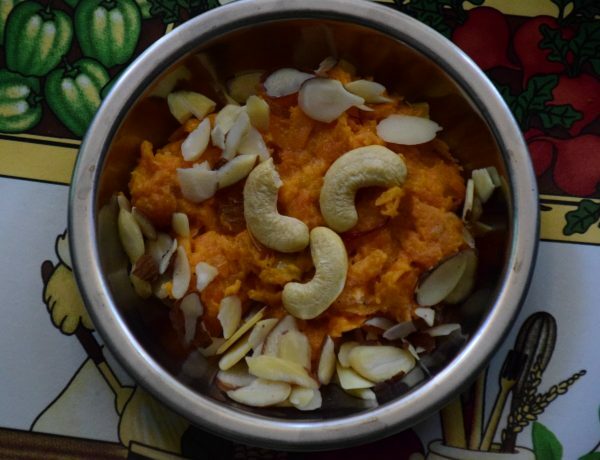 This entry was posted in Desserts, Food, Recipes, Vrat Recipes and tagged akhrot, almonds, badam, Blogging marathon, BM#90, cardamom, Carenshare, cashew, cut or grated potato, Delicious and healthy, desi ghee, Elaichi, fibrous sweet, kaju, kesar, kishmish, less starch more fiber, less sugar, low sugar dessert, mushy sweet potato, naturally sweet, not Jimikand, not yam, nuts, or no sugar, properly roasted, pure, shakarkandi, shweta jindal, single-serve desserts, Single-serve sweets, vrat recipe, wlanuts, zindagisikhati. Thank you Farah ! This is my mom’s recipe. 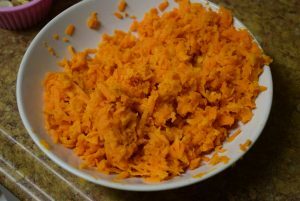 Sweet potatoes are rarely used in my home too. But their chaat is yummy and better than potato’s chaat anyday. Halwa in any form tastes good. Nice one. Thank you dear, :). Though I am not a fan of Halwa,I liked this one. 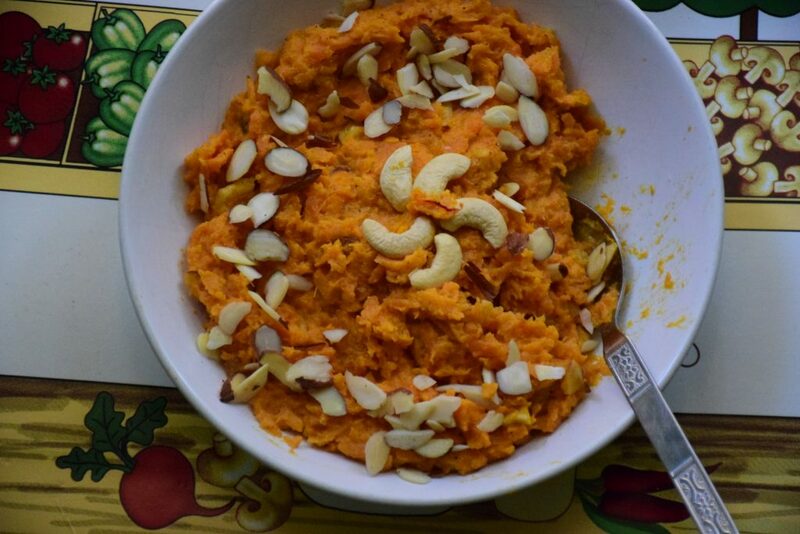 I am somehow not a sweet potato fan, but looking at that delicious halwa, I am thinking I should give it a chance… Looks so delicious! Thank you Rafeeda !! You spoke my mind. Even I was reluctant to try this, since I had never liked the sweet potato’s chaat. But this healthy sweet buttery halwa is irreplaceable .Give it a try and you won’t repent . 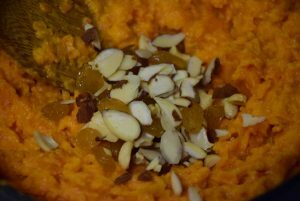 Wow this almost sounds like the carrot halwa, very nice one..will love to try this sometime. 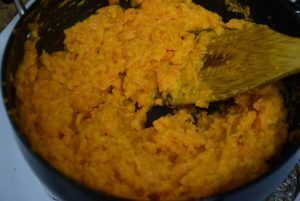 To me , it was easier than Carrots Halwa, almost like potato’s halwa. But better than potato’s halwa both in taste and nutrition content. Please give a bowl of this halwa, wish i live near you to enjoy this lipsmacking halwa. Excellent dessert. That is a good one, Shwetha. 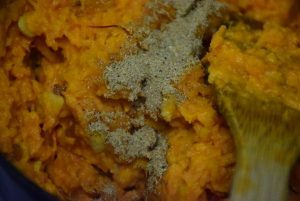 My kids love sweet potato and this is something which can be whipped up instantly as well. Thank you Harini, yes if the sweet potatoes are already boiled , it won’t take much time. I love making this halwa in my navratri fasting days. Looks so yummy. Wow !! I tried it first time, and admit that this is anyday better than Potato halwa! Looks so tasty and perfect option for navratri.